The new GICS sector re-classifications finally took place today, and below are the details. Sector classifications for public companies are determined by the Global Industry Classification Standard (GICS), which is maintained by S&P and MSCI. 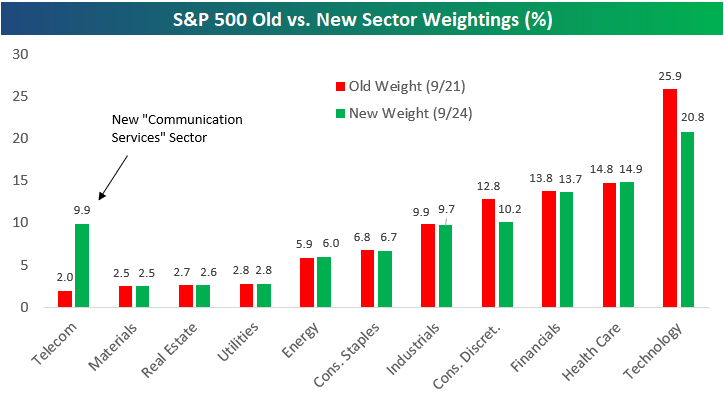 Below is a table showing S&P 500 sectors with both their new weightings and old weightings in the index. We also include the ETF that investors can use to gain exposure to each sector. As shown, the old Telecommunication Services sector is no more, and the new sector is called the Communication Services sector (ETF=XLC). 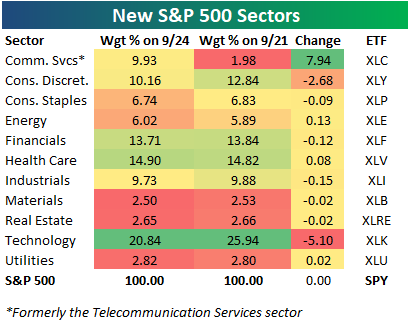 The 3 Telecom stocks that made up just 1.98% of the S&P 500 as of last Friday are now part of the new Communication Services sector, which has a weighting of 9.93%. The only other sectors that are affected are Technology and Consumer Discretionary. Due to re-classifications, Technology’s weighting drops by 5.1 percentage points down to 20.84, while Consumer Discretionary’s weighting drops 2.68 percentage points down to 10.16%. For Bespoke’s in-depth sector analysis, start a two-week free trial to Bespoke Premium. 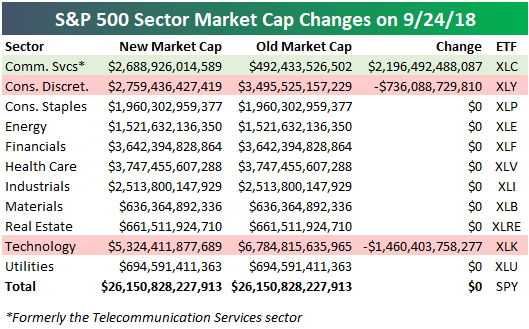 In terms of size, the new S&P 500 Communication Services sector has a total market cap of $2.69 trillion, which is $2.2 trillion more than the old Telecommunication Services sector’s market cap. The Consumer Discretionary sector now has a market cap of $2.76 trillion, which is down roughly $736 billion from where it stood last Friday. The Technology sector now has a market cap $5.3 trillion, which is down $1.46 trillion. Below are the 23 S&P 500 companies that saw sector re-classifications. 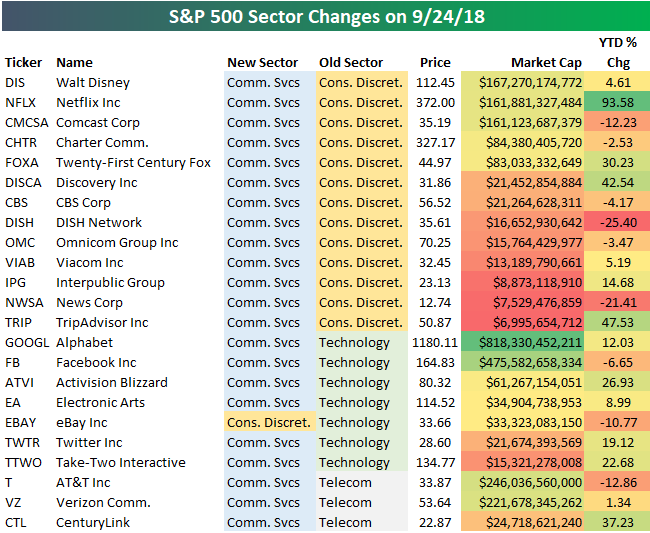 The main stocks shifting from Consumer Discretionary into Communication Services are Disney (DIS), Netflix (NFLX), and Comcast (CMCSA). Others making the same shift include Charter (CHTR), Twenty-First Century Fox (FOXA), CBS, Viacom (VIAB), News Corp (NWSA), and TripAdvisor (TRIP). Six companies are shifting from Technology into Communication Services — Alphabet (GOOGL), Facebook (FB), Activision Blizzard (ATVI), Electronic Arts (EA), Twitter (TWTR), and Take-Two Interactive (TTWO). One Tech stock — eBay — is shifting into Consumer Discretionary (joining Amazon.com). Finally, AT&T (T), Verizon (VZ), and CenturyLink (CTL) all shift from the old Telecom sector into Communication Services.